Barefoot Angie Bee: Tropical Traditions Coconut Oil Giveaway! A while back I talked about using coconut oil as a moisturizer as well as a food. After my review, I was contacted by Tropical Traditions and told to go ahead with a giveaway to one of my readers! If you are not sure what to do with coconut oil, check out this recipe page. I am thinking the Coconut Drop Biscuits look mighty tasty! Here is my post about Tropical Traditions Coconut oil. Think chocolate and spa socks! Coconut oil is some fantastic stuff that smells heavenly and tastes that way too. Regardless of the health benefit claims, it is nice to have around. I feel much better about using it as a moisturizer on the spawn too. I encourage you to look at their site and see the benefits of using coconut oil as well as the other coconut products they sell. I find the production to be interesting. So on to the good stuff!! How to win a 32 oz jar (this is huge btw!) 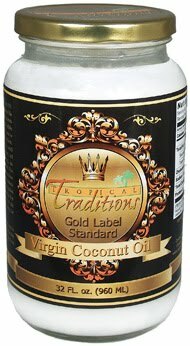 of Gold Label Tropical Traditions Virgin Coconut Oil. second Tropical Traditions asks that you sign up for their newsletter. I am signed up and don't find it to be "one of those" kinds of newsletters. It is actually full of useful information and updates to the recipe page and they do not share you email with other companies. You can also "like" them on facebook here. This giveaway will run for one week. I will choose a winner using Random.org on June 12th. Do we go to their site to enter or are we supposed to do it somewhere on your page? I follow you, and I subscribed to the newsletter. Interesting post and very nice blog. Congrats. I am too far to enter the giveaway. Hi from Italy. I Love coconut oil! We cook with it and it's our family's favorite moisturizer. I'm a massage therapist and I use it in my practice - my clients love it. I just signed up for their newsletter too! My mom SWEARS by coconut oil! I can't wait to try it! I'm a follower of Tropical Traditions on Twitter. I tweeted your giveaway. I'm windyrunner on Twitter. I'm not on Twitter but I did like them on FB! And I just signed up for the newsletter. Thanks, Angie!!! I signed up for their newsletter. We use coconut oil a lot on the SCD, it helps with the yeast issues! I am a fan on Facebook and signed up for the newsletter. Hopefully I will win, so I get the chance to try this new product! LOVE Tropical! Blog follower and just signed up for the newsletter.